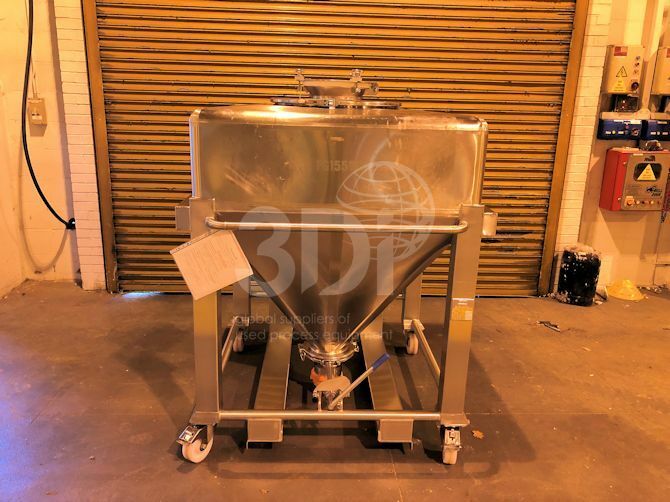 Used 700 Litre BSI Stainless Steel IBC, manufactured by BSI, 2001, Type FG Bin. Material of construction 316 stainless steel. Dimensions 1300mm x 1300mm x 1725mm overall height. Used for the transportation and storage of powders and granules. Fitted with four mobile castors, and manual bottom butterfly discharge valve 200mm. Mounted forkliftable base. Previously used on pharmaceutical powders.